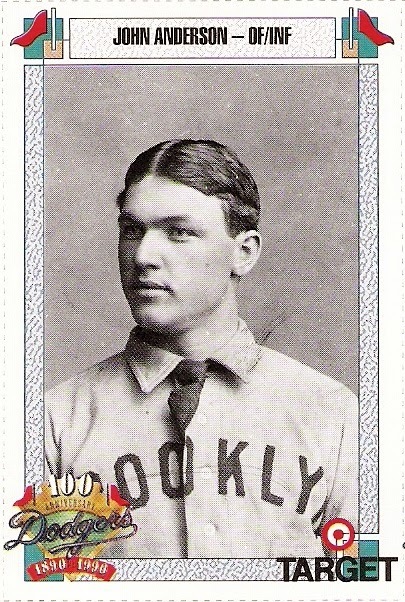 honest john anderson played for the brooklyn bridegrooms from 1984 through 1899, including two stints with the club during the 1898 campaign. anderson had played in 345 games for the bridegrooms through the 1897 season, accruing 436 hits and a .310 batting average. after hitting .143 in six games for the club in 1898, anderson was sent to the washington senators. he played for them into september of 1898, slugging .516 in 110 games. even with that performance, he was returned to brooklyn for the last few weeks of the season. in 19 games during his second stint with the club, he hit .275. even with his subpar brooklyn stats, anderson was able to lead the league in slugging. anderson was a bridegroom again in 1899, but then moved on to the milwaukee brewers. the now-superbas brought him back from the minor league team after the 1900 season, but he returned to the brew crew before the 1901 season began, narrowly avoiding a triple-dipping. i don't know how target assembled the set as far as which players appeared on which sheet, but there are a couple of common threads on this week's sheet - by name and by way many of the players came to be a part of the franchise. 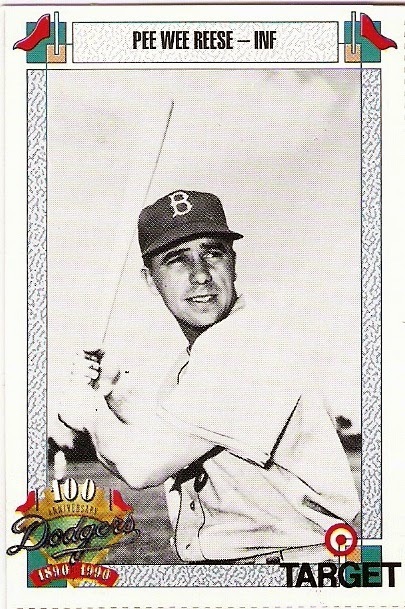 this week's sheet of players from the 1990 target dodger 100th anniversary set starts off with number 1.
reese was the dodger shortstop from 1940 through 1956 except for three seasons (1943-1945) during which time he served in the armed forces. 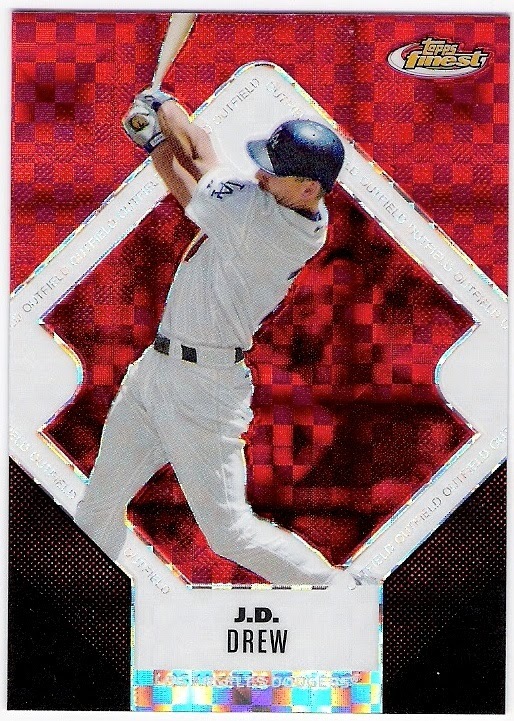 he was a 10-time all-star and a 7-time world series participant who sits atop the dodger all-time career leaderboard in war, walks, and runs scored, and is second to zack wheat in a number of other categories. 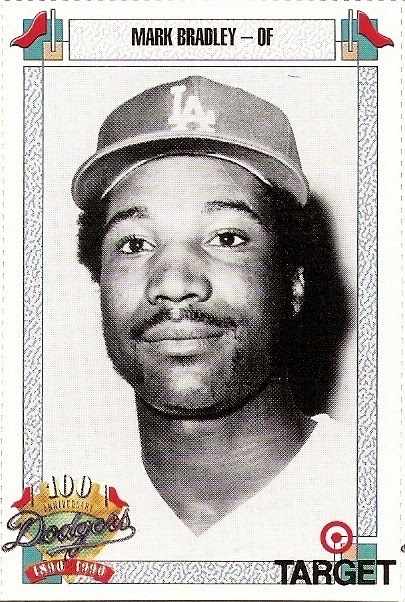 as a robin/dodger, reis played everywhere but catcher and shortstop. his big league career began with the robins in 1931, and he played exclusively third base at that time, hitting .294 over six games. he was back up in 1932, but played in just one game going 1 for 4 at third. reis returned to the big leagues in 1935 with the dodgers, but this time he found himself on the mound 14 times, including 2 starts. reis put together a record of 3-2 with 2 saves, a 2.83 era and an 11-inning complete game to boot. 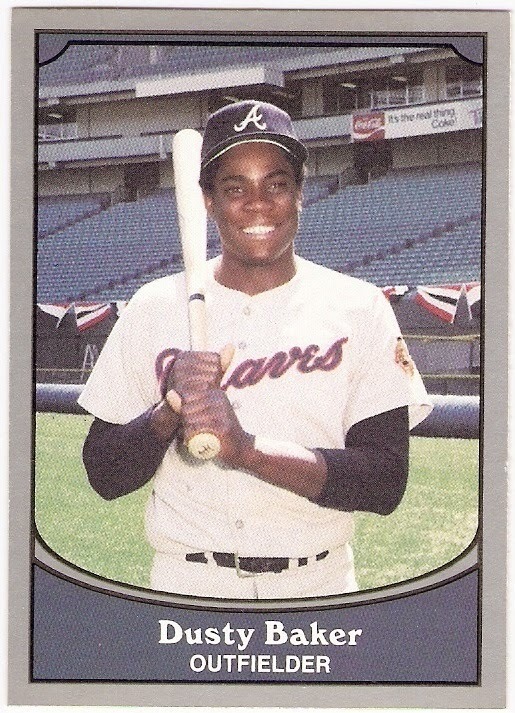 he also played in the field in about three dozen other games that year. 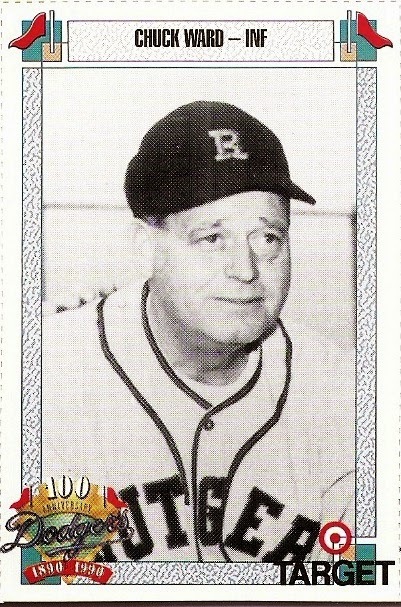 reis was traded to the boston braves for the 1936 season, where he maintained his two-way play for three seasons. 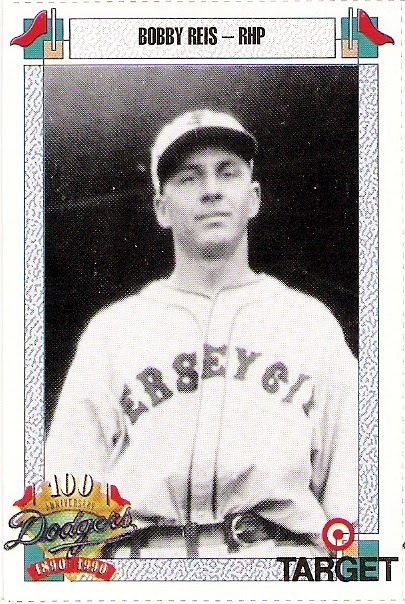 his photo, by the way, comes from 1932 when he played for the jersey city skeeters. 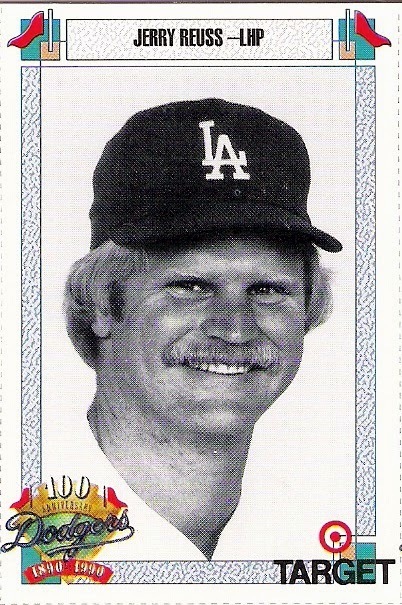 reuss came to the dodgers at the start of the 1979 season from the pirates in exchange for rick rhoden. 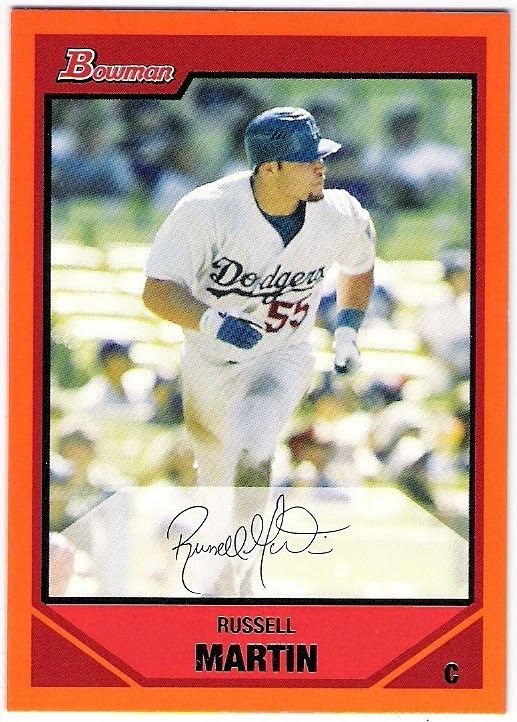 i was a fan of rhoden, and so i wasn't too excited with this development especially when reuss went 7-14 in his first season with the dodgers. 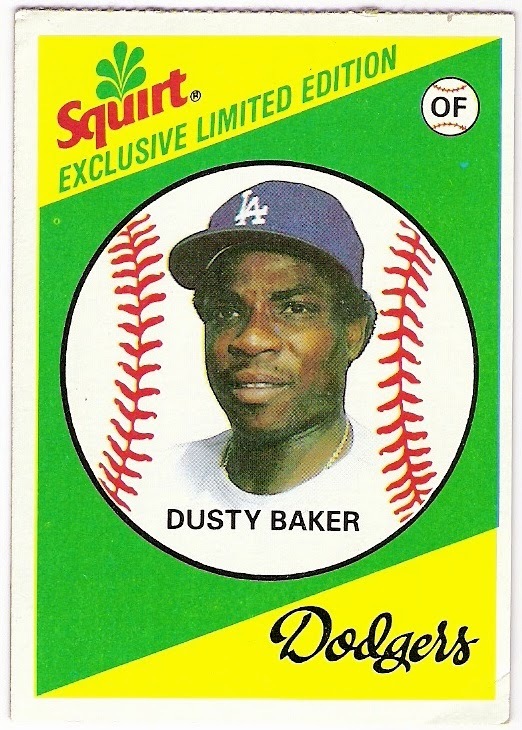 then came his 1980 season, complete with an 18-6 record, 2.51 era, all-star berth, league-leading six shutouts, complete game victory in must-win game 161 against the astros, and most importantly his no-hit performance against the giants. i was a reuss convert. 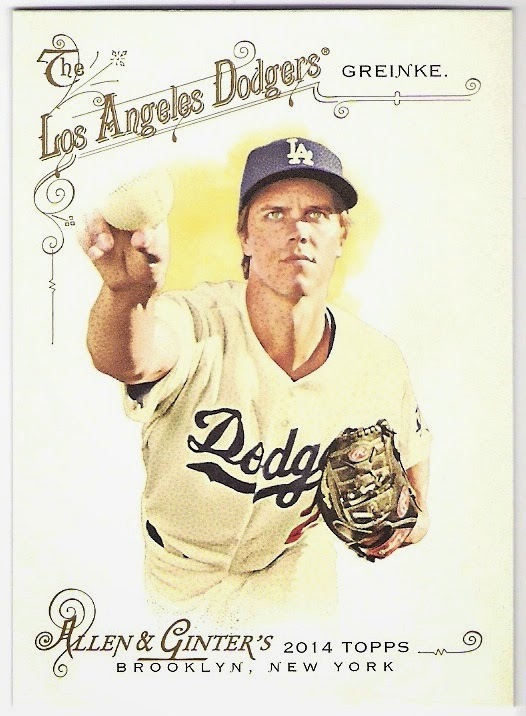 reuss also pitched well in 1981, helping the dodgers win the division series against the astros and eventually the world series over the yankees with complete game clinchers in each series, and he stayed with the team into the 1987 season. don't forget to check out his website for some cool photos and other stuff. 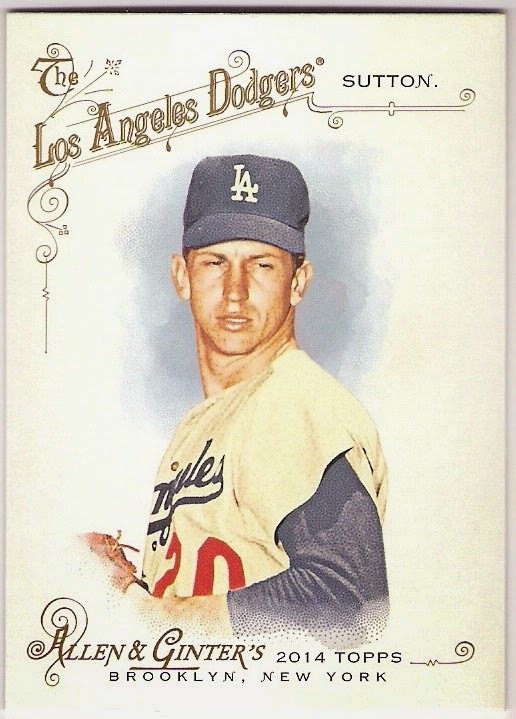 bailey was a hot prospect for the pirates in the early 1960's, but he failed to live up to the lofty expectations, later becoming half of the haul (gene michael was the other half) that the dodgers received from the pirates in the maury wills trade prior to the 1967 season. 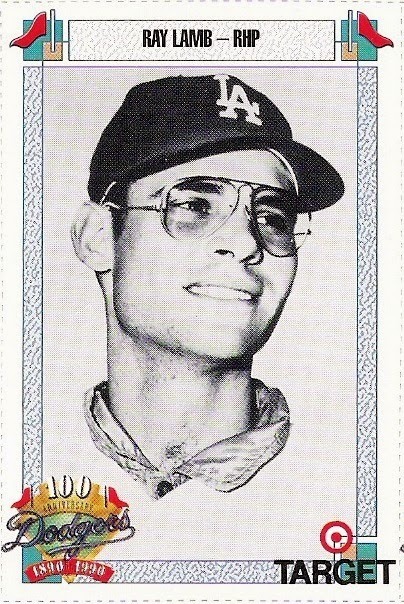 he played for the dodgers for two seasons, hitting .227 (73 for 322) in both 1967 and 1968, and his contract was purchased by the expos following the 1968 season. bailey was the first baseman in their inaugural game, and became the first expo to get a hit and the first to drive in runs. in fact, bailey had his best offensive years with the expos as he realized some of the potential that the pirates had hoped for. after several seasons in montreal, bailey eventually found his way to the reds, where he was a member of their 1976 world championship team, although he did not play in the postseason. 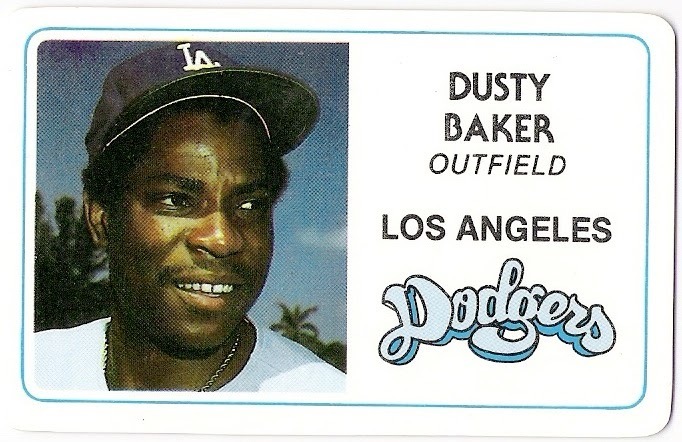 bradley was a late-season call up for the dodgers in 1981 and 1982. he was their first round pick in 1975, and appeared in a total of 17 games for them in those two aforementioned seasons. bradley's last game as a dodger was their final game of the 1982 season, when joe morgan and the giants dashed their postseason hopes. he was traded to the mets prior to the following season. 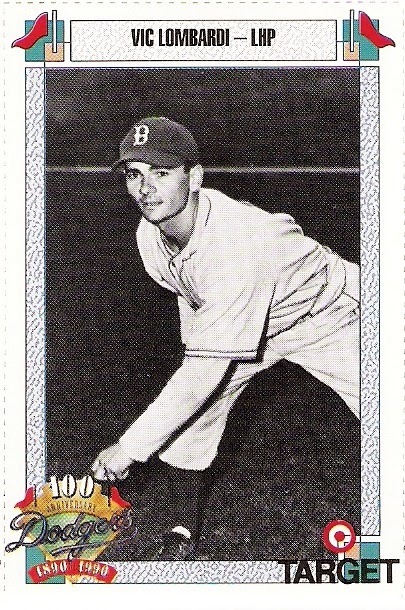 galan was acquired by the dodgers from the cubs during the 1941 season. 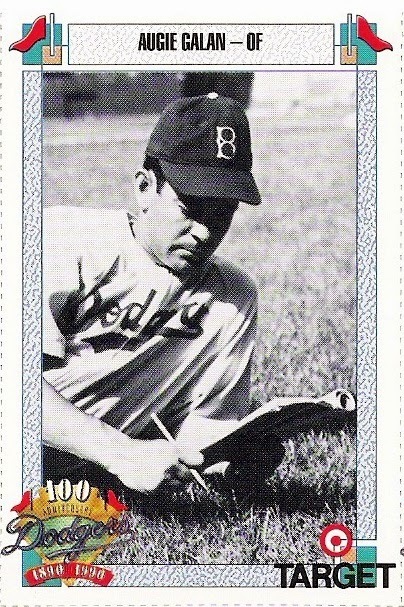 he remained a dodger through the 1946 season, playing mostly outfield, and was a national league all-star in 1943 and 1944. it appears that he enjoyed a crossword puzzle as well as playing baseball. 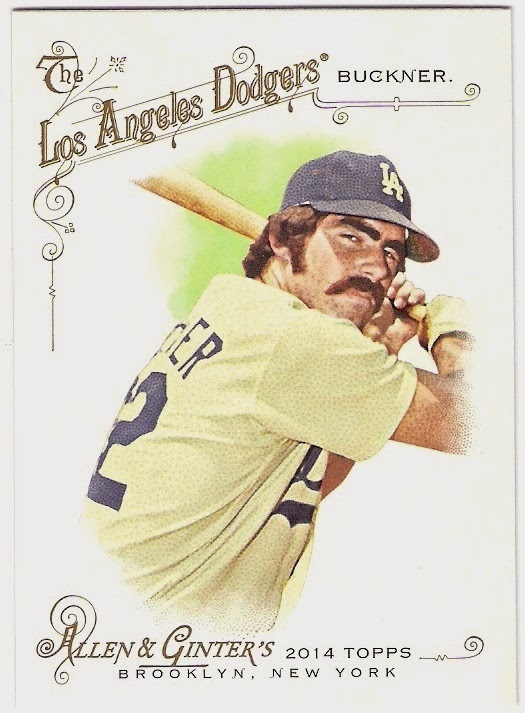 lamb was a reliever who pitched for the dodgers in 1969 and 1970. he even found his way on to a topps card in 1970, sharing space with bob stinson. he was 0-1 with a save and a 1.80 era in 10 games during his debut season, and then 6-1 with a 3.79 era in 35 games the following year. lamb was traded to the indians in the duke sims deal after the 1970 season, and he spent three seasons in cleveland working as a reliever and a sometimes starter. 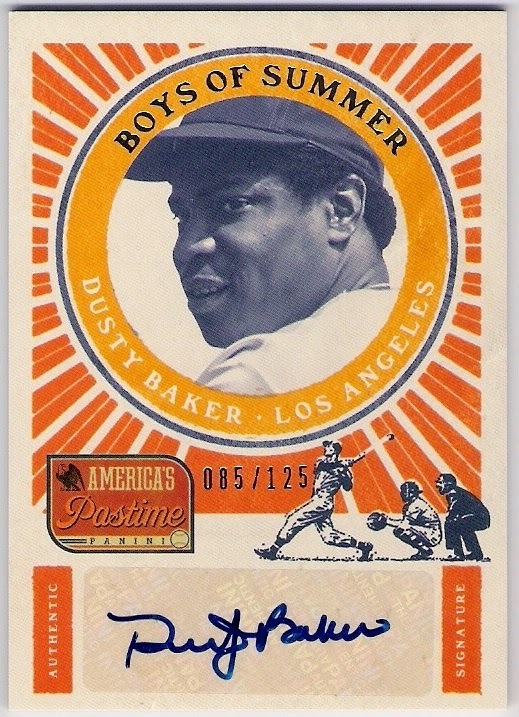 he is the only dodger to wear number 42 after jackie robinson, doing so in the 1969 season. 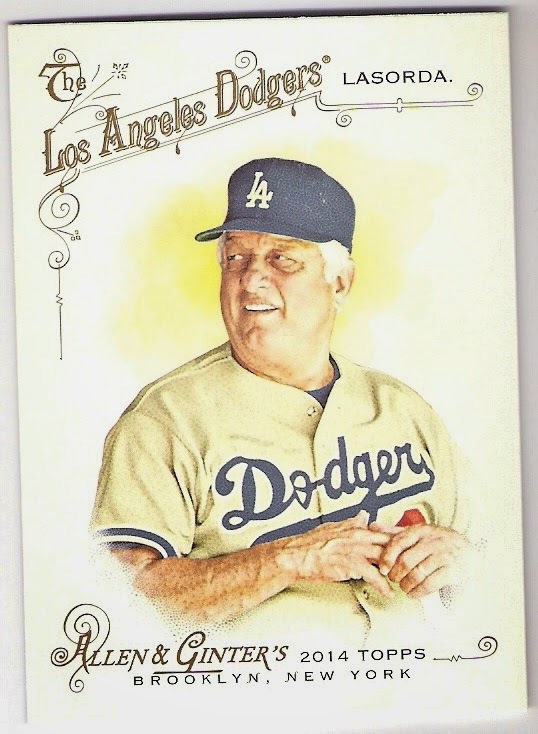 lombardi pitched for the dodgers from 1945 through 1947. he won 10, 13, and 12 games in those seasons with his era consistently around 3.00. following the 1947 world series, in which lombardi made two starts, he was traded to the pirates in the dixie walker deal that netted the dodgers, among others, preacher roe. mamaux was part of the trade between the robins and pirates prior to the 1918 season that saw casey stengel head to pittsburgh with burleigh grimes going to brooklyn. mamaux had won 21 games twice for the pirates, but his high during his six seasons with the robins was 12 in their pennant-winning 1920 season. 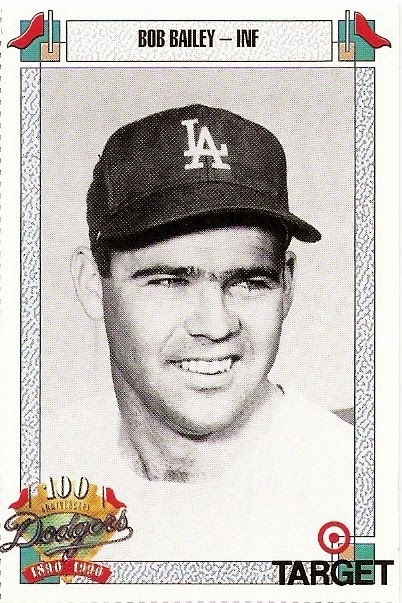 norm was the older brother of larry sherry, the dodger pitcher. together they formed a rare fraternal battery from 1959 to 1962 - the span of norm's dodger career. norm is probably best known as the guy who suggested to sandy koufax that he relax and not try to throw so hard prior to the 1961 season. koufax took his advice and went on to dominate the league for the remainder of his career, while norm wound up with the mets in 1963.
stack pitched for the dodgers and superbas in 1912 and 1913. he was 11-9 with a 2.99 era in that span, but was traded to the cubs during the 1913 campaign. 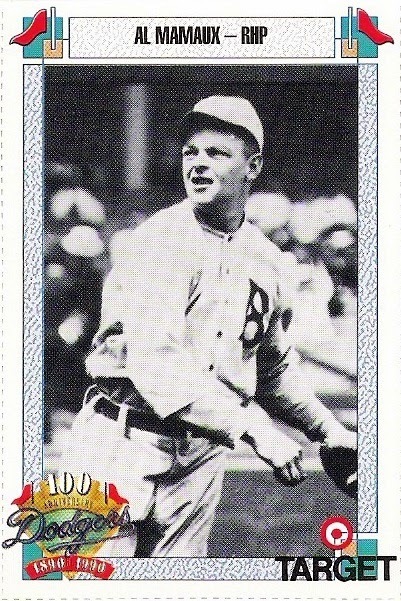 arnold john 'jigger' statz played in the major leagues for eight seasons beginning in 1919, the last two of which he spent in brooklyn with the robins. while he hit .264 over those two seasons, bringing an end to his major league career, he found tremendous success in the pacific coast league with the los angeles angels. 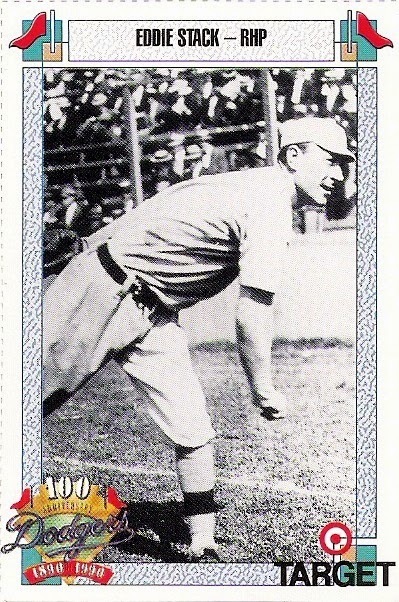 statz had spent time with the angels while bouncing up and down from the big leagues, but he returned to the club for good in 1929 and wound up setting pcl records in a number of categories. as such, statz is a member of the pcl hall of fame. templeton debuted for the dodgers on september 9, 1955 in chicago. 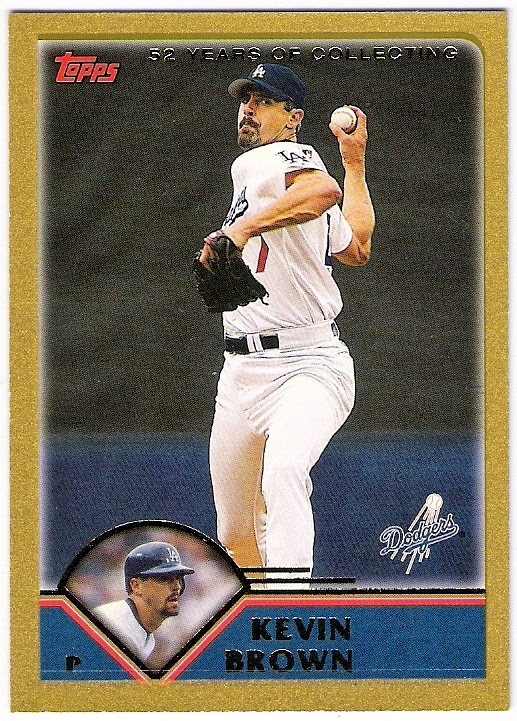 he retired all six of the cub batters he faced that day, but the dodgers lost despite his perfect relief effort. he appeared in three more games during that midwestern road trip, allowing runs in each of those appearances while taking the loss in his last appearance of the season thanks to the fact that he walked the only batter he faced (stan musial) to lead of the bottom of the 12th innning. 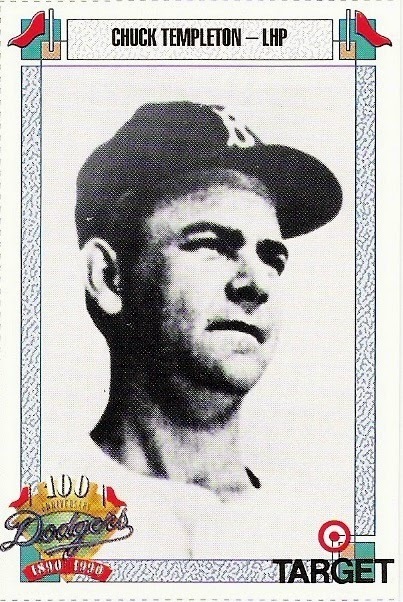 templeton returned to the majors in 1956, taking the second loss of his career in his first start of the season which just happened to take place in saint louis. he finally got to pitch in brooklyn his second time out in 1956, going four innings as the starter in what turned out to be a 7-5 dodger win over the cards. 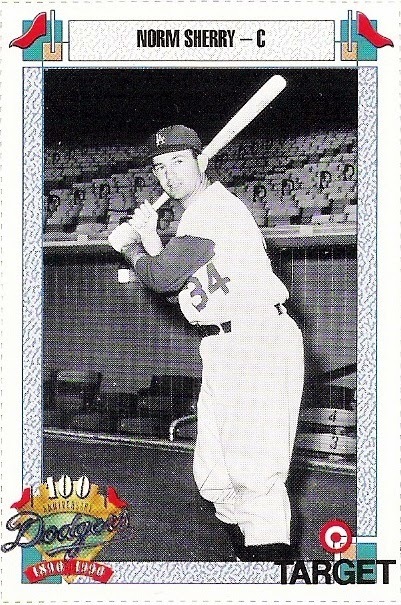 he was sent down to the dodgers' saint paul affiliate in the summer of '56, and did not return to the majors. ward was part of the trade i referenced earlier between the pirates and dodgers. not the bob bailey/maury wills trade nor the preacher roe/dixie walker trade nor the jerry reuss/rick rhoden trade, but rather the burleigh grimes/casey stengel trade. 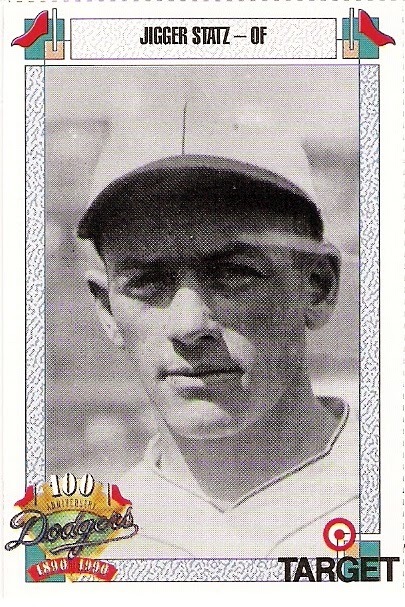 ward, who had succeeded honus wagner as the pirates' shortstop, accompanied grimes and mamaux to the dodgers in january of 1918, and appeared in 111 games as a backup shortstop and third baseman over the next 5 seasons. he apparently has some connection to rutgers university, but i failed to uncover exactly what that connection was. the fifteenth brooklyn-ite on the sheet is john anderson, who double dipped with the franchise and so gets his own post later today. 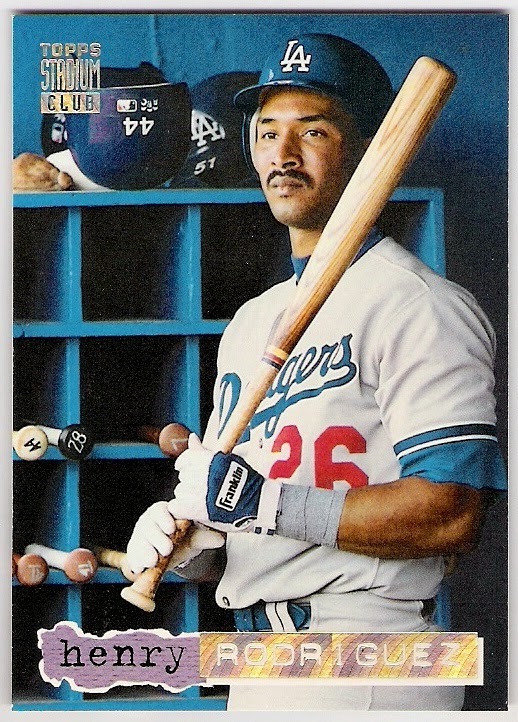 because steady eddie was once a dodger who, while wearing dodger blue, led all of mlb in 1990 with a .330 average. 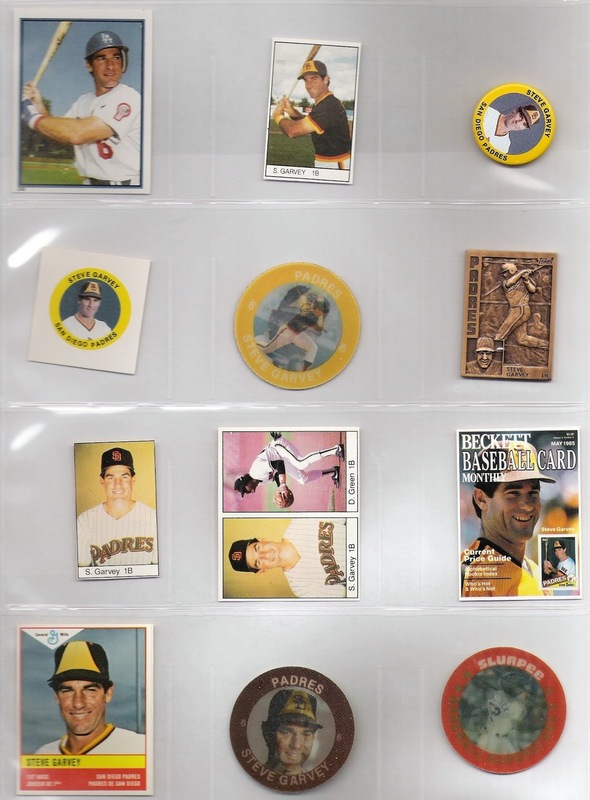 the murray is in the same trading group as a bob gibson auto, tony gwynn relic, and a jose canseco auto. that's stiff competition, and i hope my return package does well against the bounty wes is sure to receive for the other cards in this aptly named 'group of death'. we'll see over the next week or so. to keep murray company in the package. 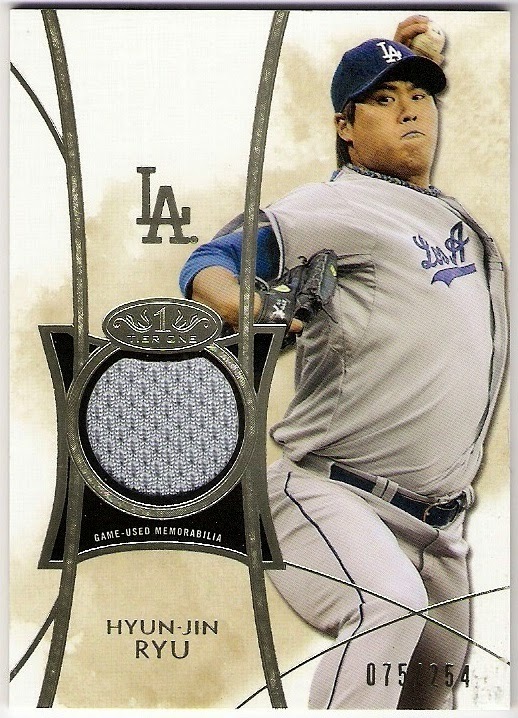 ryu returns from the dl tomorrow, just in time to save the dodgers from another kevin correia start. it's not often that i receive a package of cards that contain no plain old base cards, but that's what happened a while back. for some reason, i've been delinquent in posting about this particular trade package that i received from wes at jaybarkerfan's junk, but that doesn't reflect my level of appreciation for it. there were 8 cards total, with all but one being serial numbered. have a look. the sport goggles! game over! that's a nice angle on the top deck and reserve sections of dodger stadium behind the giant kuo. these days, those seats are baby blue or sea-foam blue or whatever it was that the o'malley's originally had installed in the stadium. 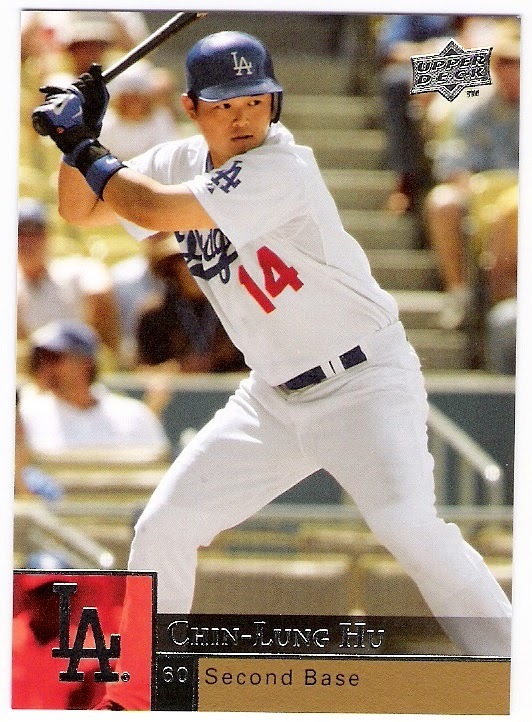 as for the card, this is kuo's base card, but he was a rookie, so his card in the set is serially numbered. 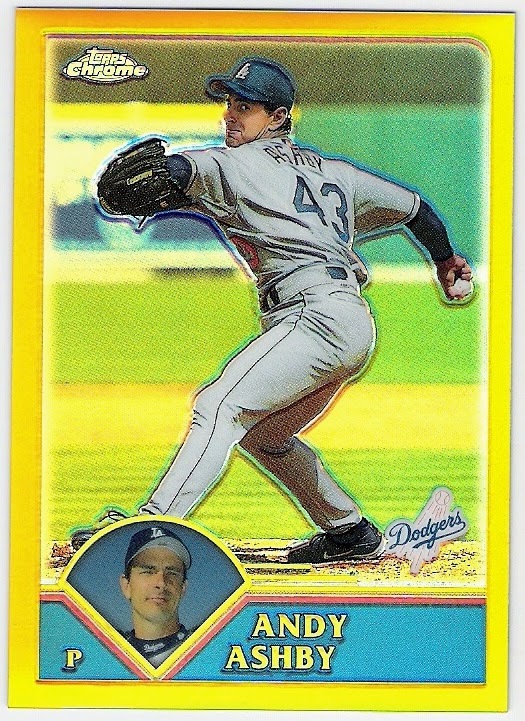 2003 was brown's bounce-back season for the dodgers as he returned to form with a 2.39 era and made the yankees want to trade for him despite his huge contract. that is a nice shiny card. unlike brown, ashby was 3-10 with an era over 5 in his final year with the dodgers. 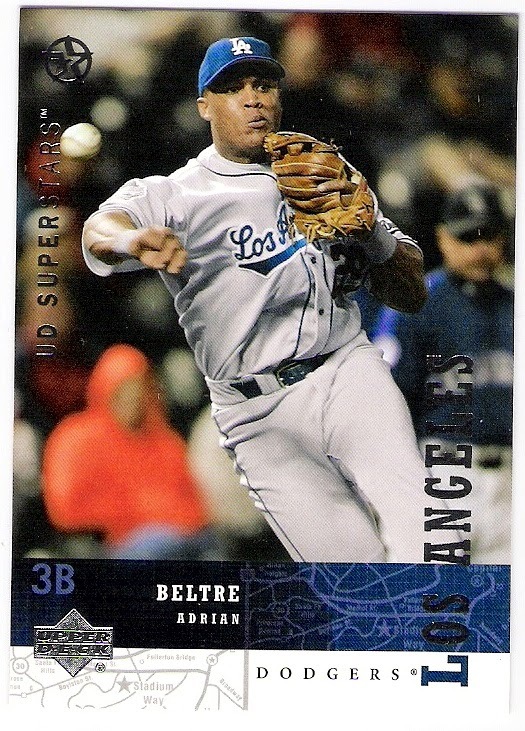 still, he wasn't unwanted, as he returned to san diego as a free agent for the 2004 season. 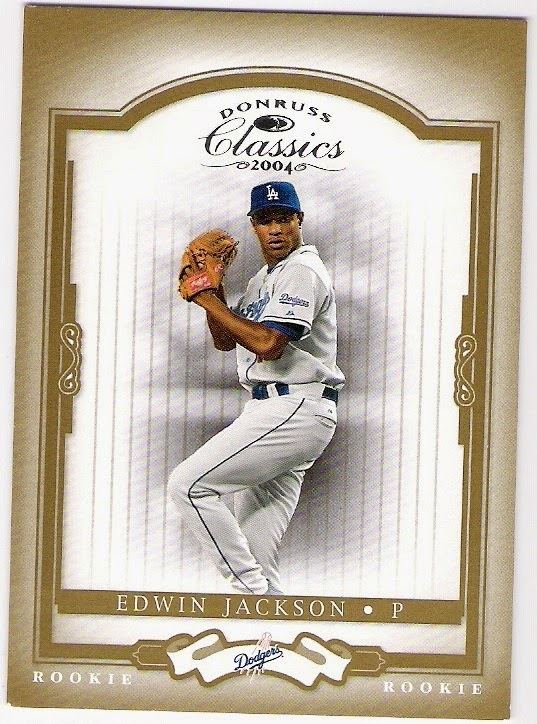 similar to the kuo card, this is jackson's base card - it's just numbered because he was a rookie. i've mentioned seeing jackson's final 2003 start before - it was in san francisco, and he allowed 2 hits and no runs over 6 innings. he struck out 7, but gave up 8 walks! 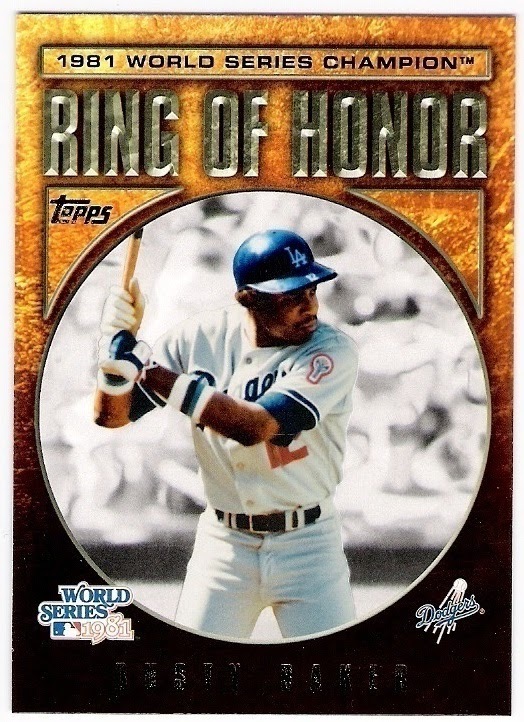 still, the dodgers were up 1-0 after 8 innings, barry bonds had struck out twice (and walked and was hit by a pitch), and i was looking forward to seeing eric gagne get a save. 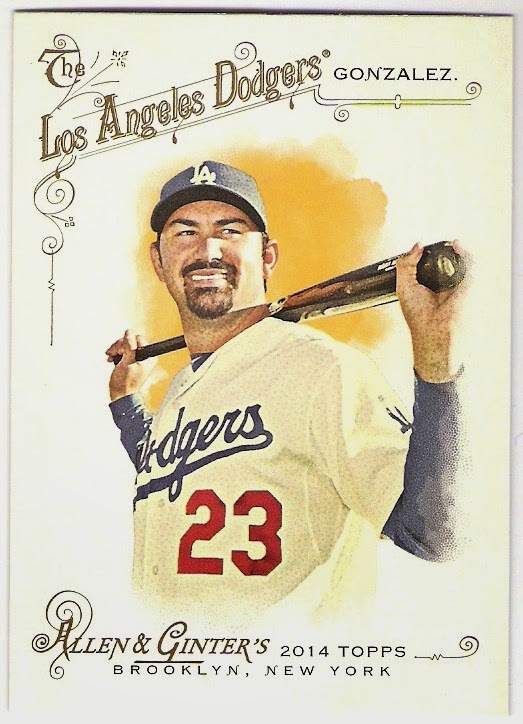 the dodgers went and scored three times in the top of the 9th, so even though gagne pitched, he didn't get the save. 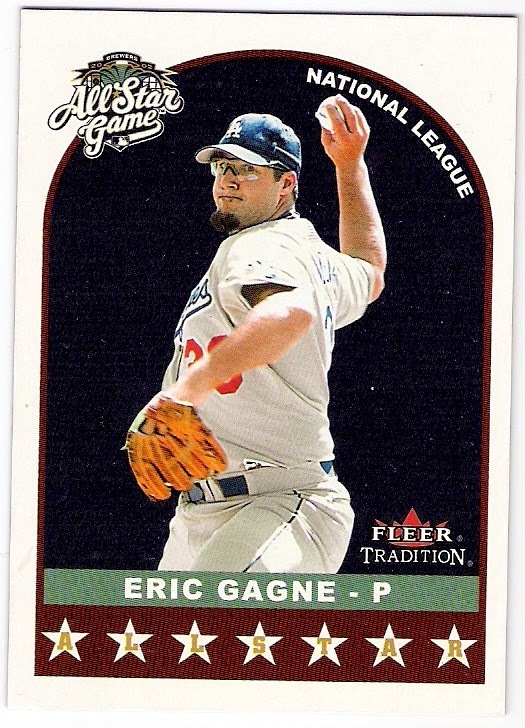 in fact, i think that the only game in which i saw gagne earn a save in person was the night before shawn green's 4-homer game in milwaukee. that was in the early part of gagne's career as a closer, so it wasn't quite the event that a gagne save eventually became. martin has caught nine extra-inning complete games this season, including a 16-inning affair. i don't know if that is abnormal or not, but it's a cool stat. 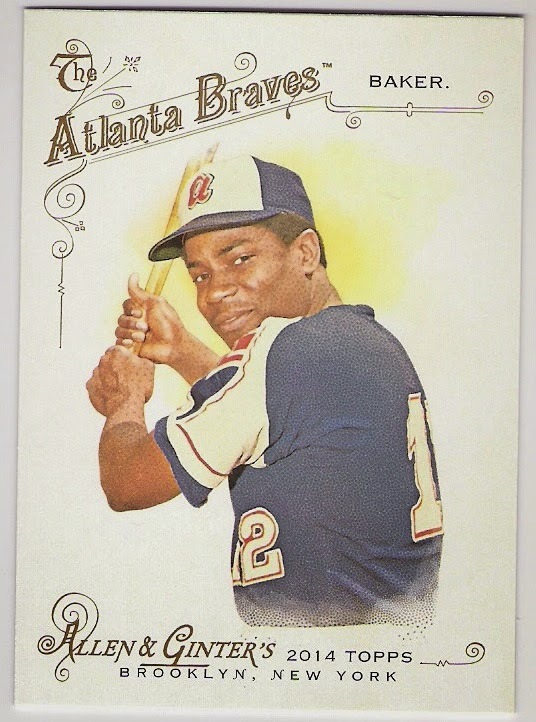 he's also hitting .292 on the season which would look nice for a catcher in a dodger box score these days. 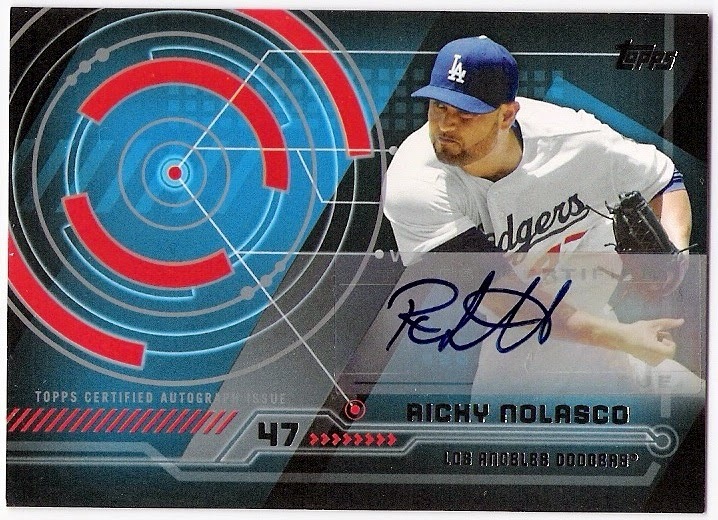 topps went all out with nolasco in 2014, adding his sticker auto to cards in multiple sets, and then he went and signed with the twins. thanks again for all the cards wes! 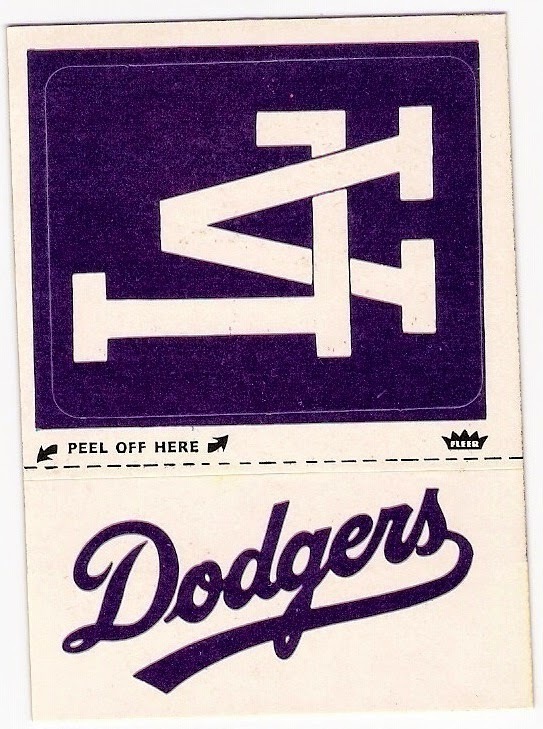 that features the 1978 topps team font and position ball! good for you, squirt. 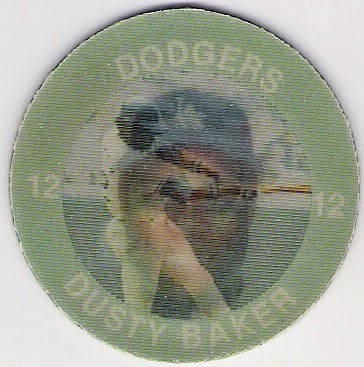 here's a 1984 7-11 slurpee coin of johnnie b.
so, i'll take dusty in a braves uniform from time to time, especially if that limits the cards of him as a giant. two more pages from the oddball garvey binder. i have these particular items in ultra-pro 12-pocket pages, by the way. 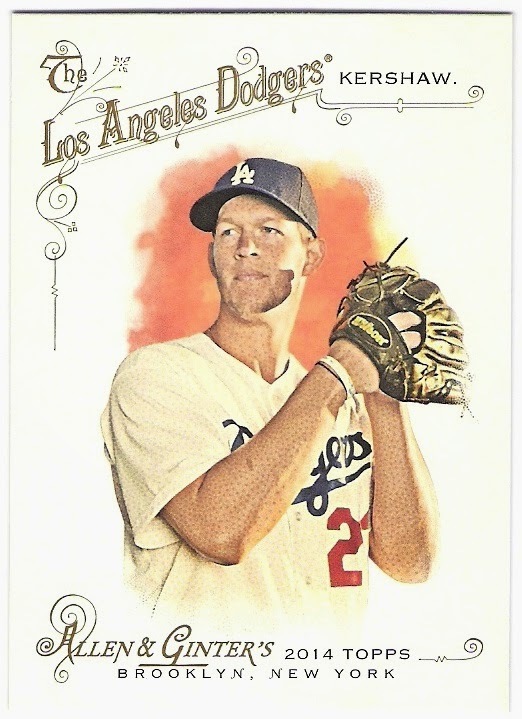 not a lot of dodger garvey goodness here, unfortuately. 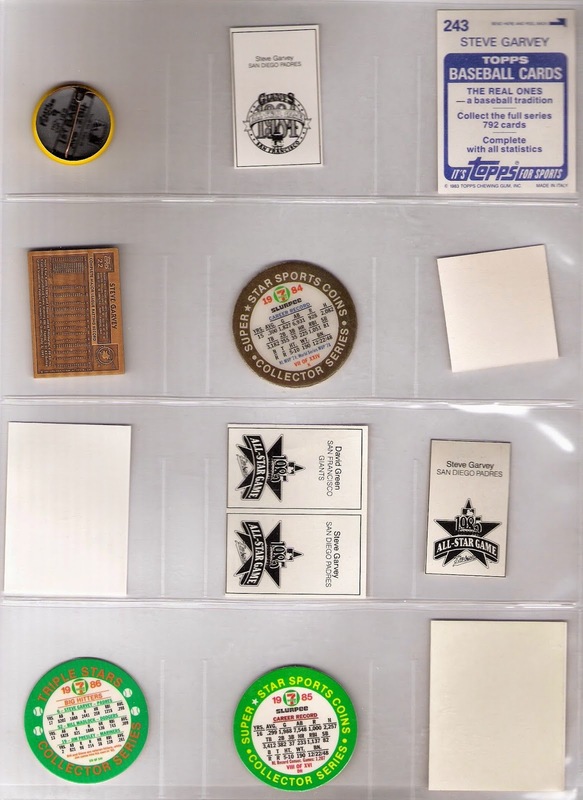 this first page has a 1983 topps sticker, the 1984 all-star game program insert, a 1984 fun foods pin (with pinback), a 1984 fun foods pin proof, a 1984 7-11 slurpee coin, the garvey from the 1984 topps gallery of immortals bronze set, a 1985 all-star game program insert of garvey solo plus one with david green of the giants attached, a mini beckett cover (this was probably cut out of an ad or something), a 1985 general mills sticker, and two more 7-11 slurpee coins - one from 1985 and one from 1986 that also features jim presley of the mariners and bill madlock of the dodgers. enjoy. 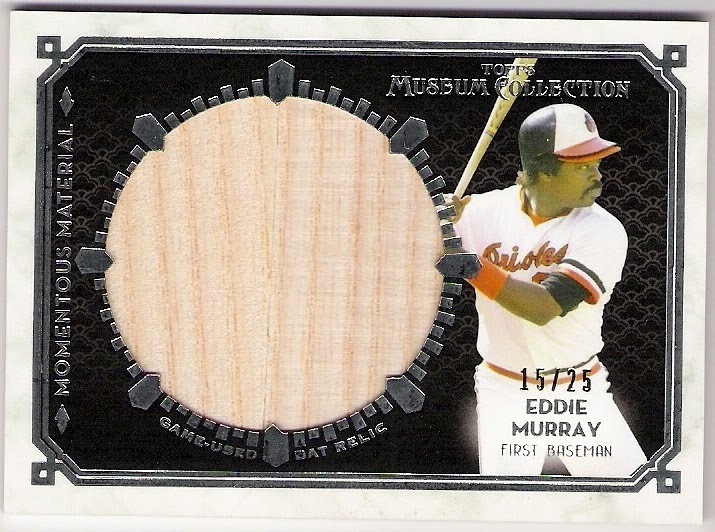 i do have one more item to show, and it is the latest garvey item to be added to the collection. 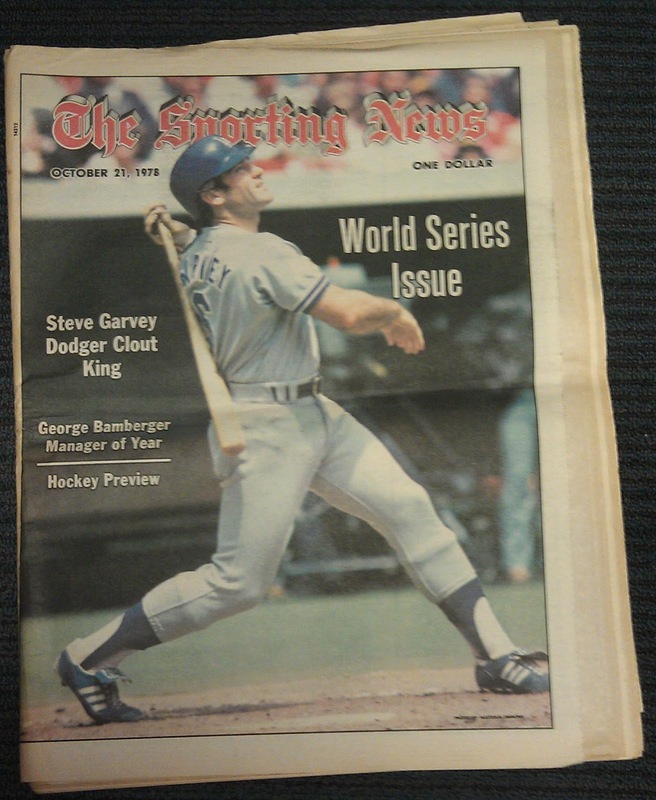 it's a copy of the october 21, 1978 issue of "the sporting news" featuring 'dodger clout king' garvey on the cover. this came to me courtesy of everybody's friend, mark hoyle. there's some good stuff in there, along with a ridiculous amount of cigarette ads. i will probably only keep the cover, but i've enjoyed looking through the 36-year old articles. 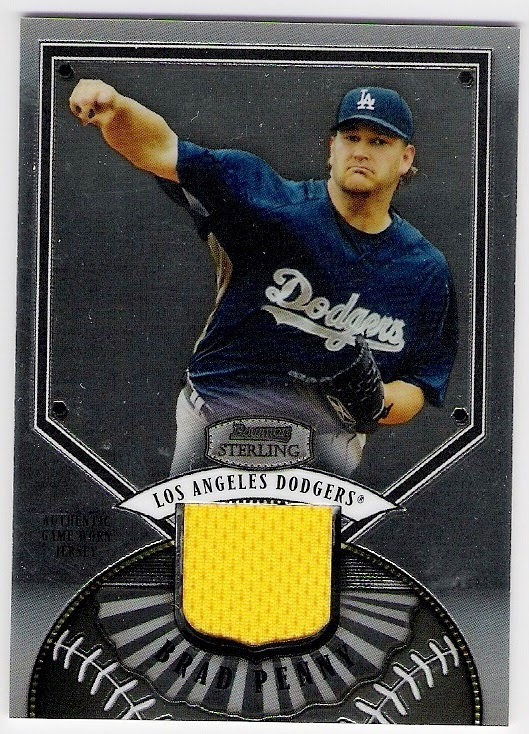 the yellow swatch comes from the 2006 all-star game festivities, where penny started the game for the national league (the first dodger to do so since hideo nomo in 1995). he struck out the side in the first - ichiro, jeter, and david ortiz - and then gave up a solo home run to vladdy in the second. 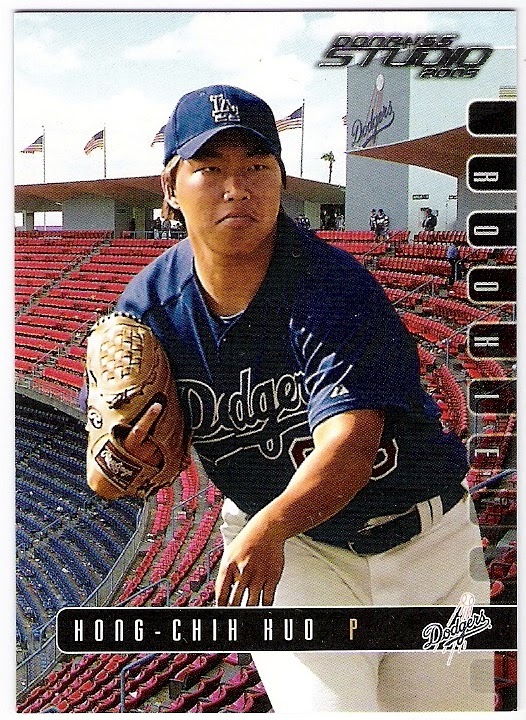 anyway, since leaving the dodgers following the 2008 season, penny has pitched for the red sox, giants, cardinals, tigers, giants (again), fukuoka hawks (japan), and now the marlins. 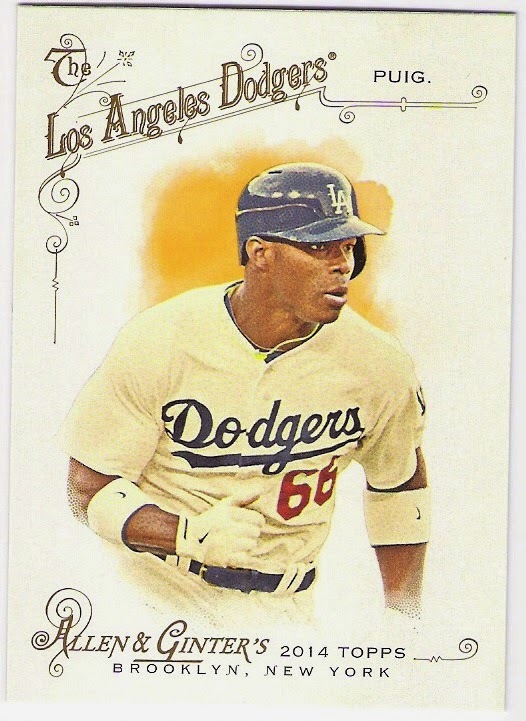 penny, of course, started his career with the marlins and pitched for them until he was traded to the dodgers in 2004. i don't know how long it will last this time around (he's got an era of 5.84 in three appearances), but i salute his efforts to remain a big leaguer. i just hope ned doesn't get too desperate for arms this weekend. in anything other than a 'random cards from the scanned folder' post, so guess what? 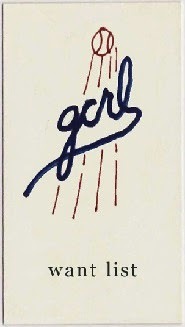 this is a post featuring a bunch of cards that have been wallowing in my scanned folder for some time. 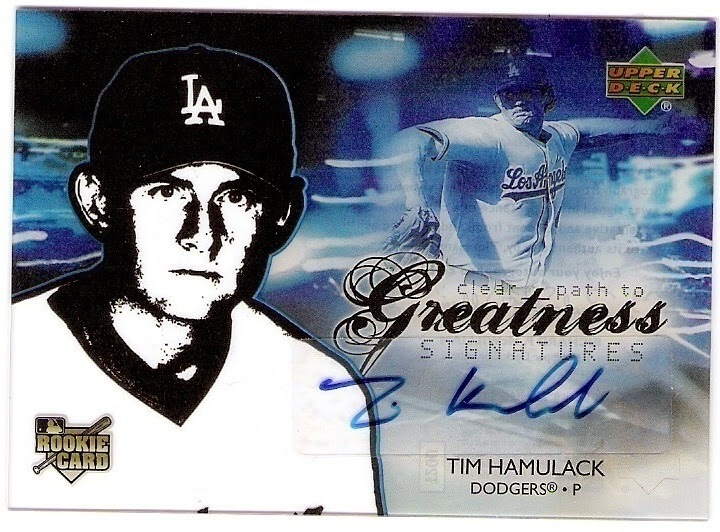 hamulack (besides being a sentence that yoda might utter if he were to be displeased with the meat selection at your easter brunch) pitched for the dodgers in 2006 and went 0-3 in 33 appearances. 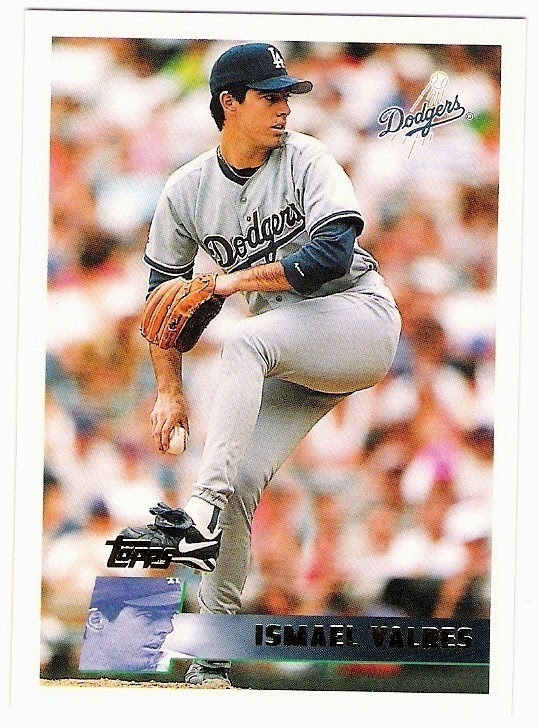 i can't say that i recall too much about him, and i assumed that he was a lefty specialist that the dodgers brought on board to face barry bonds and todd helton and other nl west lefty sluggers. well, he faced bonds only twice in 2006 - hamulack walked him and then hit him with a pitch a couple days later. not bad. 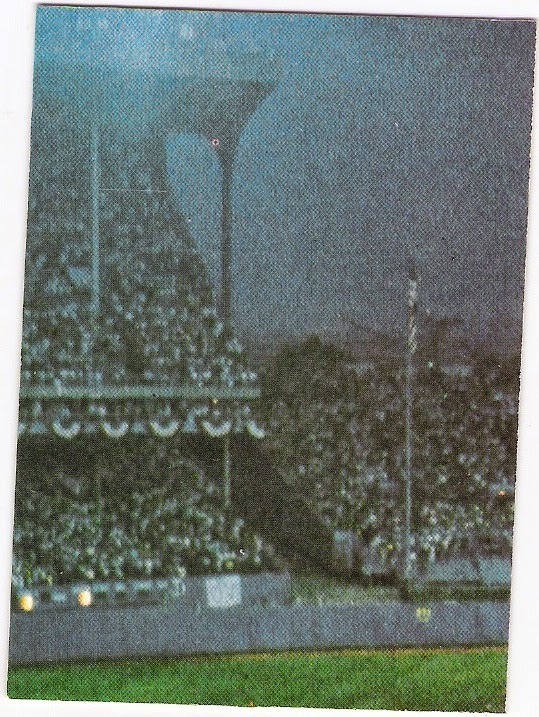 it looks like a gloomy august night in cleveland, but that may just be the 1982 fleer effect. this card baffled me when i first saw it. 'teenage sensations'? 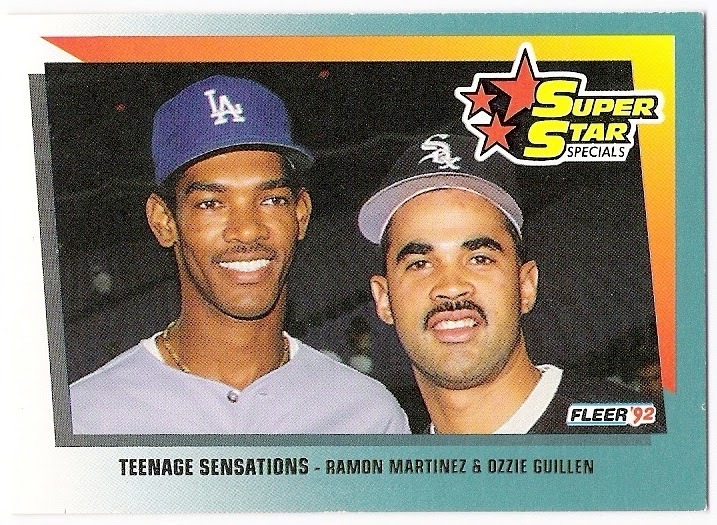 guillen was 28 and entering his 8th season in the majors in 1992, and ramon was 24. neither debuted in the majors as a teenager, so fleer must have really been reaching to make a connection here. it turns out that both made their professional debuts at the age of 17.
you can't go wrong, really, with a bat rack/helmet cubby shot. nice cameo by darryl strawberry's (upside-down) helmet. 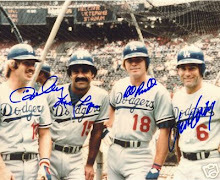 i don't know whose helmet is next to daaaaar-ryl's - no dodger wore 51 during oh henry's dodger tenure, at least according to baseball reference. dodger fans remember valdes for having delicate skin. look closely and you might see a blister on his pitching hand. 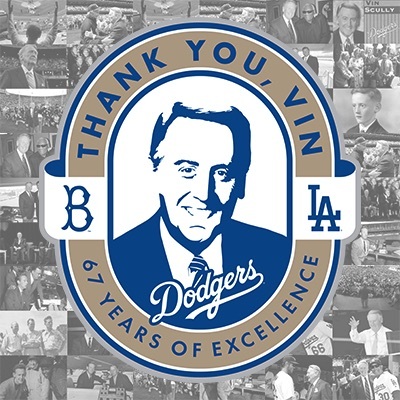 back in 2007, poor vin scully had to wait almost 3 weeks after hu had been called up for the first time to note that 'hu's on first'. in his previous five games, hu had homered, pinch-ran for olmedo saenz (who had doubled), and made outs until he singled in his fourth at bat of his sixth big league game. i am sure it was a relief to all to get that joke out of the way. 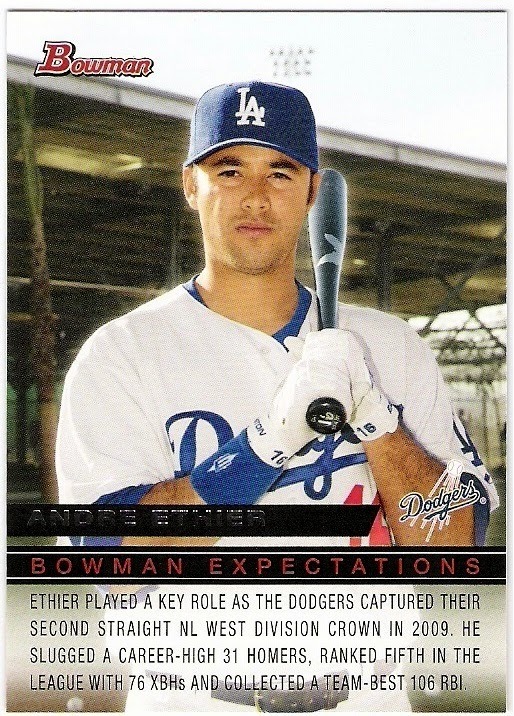 i believe that ned's expectations for ethier is to enjoy being the fourth outfielder. magill was 0-2 in six starts for the dodgers last season. this year, he's appeared in a few card releases with an auto here and there, like hamulack up above. he's yet to be called up to the bigs this year, but there's always september. a memorial patch for ernie johnson sr.
the original 30 home-run quartet has arrived!